Today, October 11, is International Day of the Girl. This year the World Health Organization Regional Office for Europe (WHO/Europe) aims to increase awareness of the devastation caused by human papillomavirus (HPV) and to increase the number of countries offering life-saving HPV vaccines. The HPV vaccine represents a tremendous public health breakthrough. According to the Centers for Disease Control and Prevention (CDC), over 90% of HPV-related cancers could be prevented through HPV vaccination. WHO recommends that all girls between 9 and 14 years old receive 2 doses of the vaccine. The U.S. recommends that all children – boys and girls – receive 2 doses of HPV starting at age 11-12. 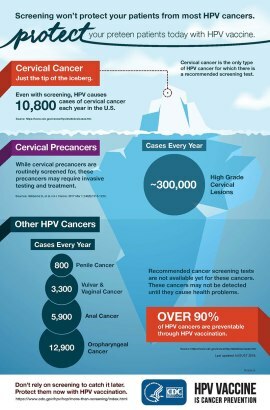 According to WHO, over 270 million doses of HPV vaccine have been administered worldwide so far, and the vaccine programs have resulted in enormous reductions of up to 90% in HPV infections and genital warts in teenage girls and young women have been demonstrated by studies conducted in Belgium, Germany, New Zealand, Sweden, the United Kingdom, the United States and Australia. In fact, Australia is set to become the first country in the world to wipe out cervical cancer, thanks to free HPV vaccination programs implemented in schools nationwide as well as screening programs. The Lancet Public Health forecasts fewer than six new cases per 100,000 Australian women by 2022, and fewer than four new cases per 100,000 women by 2035. Australian public health officials have set an elimination goal within the next 20 years. According to the International Papillomavirus Society, the Australian federal government began offering the vaccine to girls aged 12-13 in 2007, and in 2013 it was made available to boys, too. Those under 19 years old are also being offered two free doses of the HPV vaccine. Between 2005 and 2015, the percentage of Australian women between 18 and 24 years old who had HPV dropped from 22.7 percent to just 1.1 percent. “Immunization rates have increased further since 2015, contributing to what’s being described as a herd protection effect.” Vaccination rates in Australia are at 79% for girls at age 15 and 73% for boys. Free vaccines seem to have made the difference in Australia. In the U.S., HPV vaccine is only free to those who are eligible under the Vaccines for Children Program (VFC). VFC provides free vaccines to children and teens younger than 19 years of age, who are either Medicaid-eligible, American Indian or Alaska Native, or uninsured. Although most health plans now cover the costs of the vaccine, it can cost as much as US$450 for the full recommended series of HPV vaccination. Only half of U.S. adolescents are up-to-date on the HPV vaccine, and only 66 percent of adolescents between 13 and 17 years old received the first dose to start the vaccine series. WHO/Europe is hopeful that efforts to encourage more countries to vaccinate will save the lives of future generations. To date, 37 of the 53 countries in the European Region have introduced the HPV vaccine into their national routine immunization schedules. Vaccinating all girls against cervical cancer will also indirectly prevent most boys from contracting the virus. However, several countries also offer the vaccine to boys to ensure their direct and immediate protection from genital warts and forms of HPV-related cancer that affect both men and women. Learn more about HPV and the importance of HPV vaccination on Vaccinate Your Family’s website or read our previous blog post – Supercharge Your Kid’s Cancer Fighting Power.